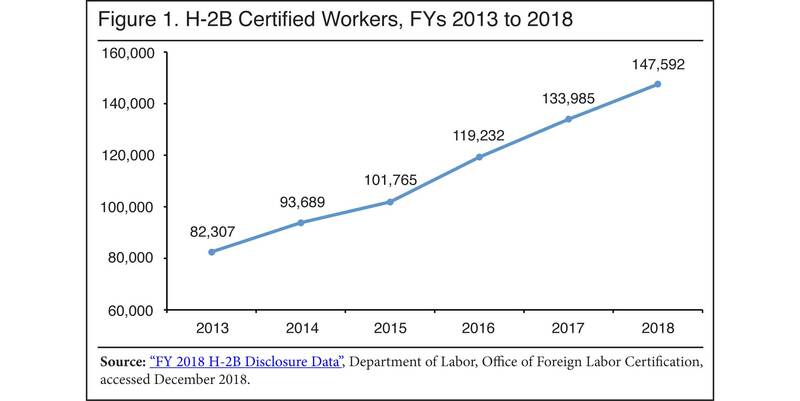 The H-2B visa has never been more popular. Across Twitter, scores of businesses and lobbying groups (see, e.g., here and here) are begging the government to lift the cap on the H-2B visa from 66,000 to 135,000. This enormous increase is possible only because of legislative sleight-of-hand that added last-minute language into the Department of Homeland Security's recent spending bill. Alongside those on Twitter are immigration attorneys advocating for changes to the program — and not just raising the cap. Some want to dissolve the cap altogether and make it easier for companies to import unlimited numbers of cheap, temporary guestworkers. A report by Law 360 includes interviews with four immigration attorneys. All argue for different yet drastic changes to the current program. One of the lawyers, Leonard D'Arrigo with Harris Beach PLLC, bemoans the revenue lost because he could not facilitate the hiring of more foreign guestworkers instead of Americans. He notes that he "has one of the largest H-2B practices in the country and very few of my clients were able to file their petitions with USCIS before the cap was reached." This of course means that D'Arrigo and his firm subsequently lost money; it is a business, after all. His solution to the problem is to permanently increase the visa cap, telling Law360 that "the market should dictate how many visas are needed, not the government usurping the judgement of seasonal businesses around the country." This is an interesting point, because the market is working just fine. The tight labor market is creating incentives for employers to increase wages, offer new benefits, and hire people they previously would have overlooked. In a sense, the federal government is distorting the market by allowing for the importation of guestworkers. This discourages competition for labor. It is not the government's job to support all businesses at any cost. There are going to be winners and losers. Winners will be those that learn how to attract and retain the available labor. Those that can't will go out of business. That is how a market works. Simply put, why is the federal government expected to be the labor broker for D'Arrigo's clients?